Fewer things bring us more Joy during the year than the bright lights of the Holidays! Last night I had the pleasure of attending a media event for Gaylord Palms “ICE” in Orlando. When the kids were younger I used to take them to see the Gingerbread displays here, but I’ve never seen ICE. It was amazing! We had the opportunity to see part of their Cirque Dreams Unwrapped stage show with flying trapeze acts, dancers and more! The stunts were breathtaking! They flew right over the audience with ease! After the show we took a short walk over to where the ICE event was being held. You walk inside the most adorable Christmas village filled with all kinds of activities and treats! (Even a Bar for the adults…Hot Toddy’s! ), but the Hot Chocolate options looked wonderful! The first thing you see when entering this festive Village is an Ice slide! Of course I had to get on that! It’s a Tube ride that you can race your friends down the ice! Fair warning…. Pick up you bum! I thought they said DON’T pick up my bum so that made for an adventurous ride!! But really it was super fun! All the adults were having a blast right alongside the kids! I can see this whole attraction as being a great date night or family fun night out! We then moved on to the rest of the Village which included a room set up with large tables to decorate Gingerbread cookies and appearances by the cutest Gingerbread couple, along with the Peanuts Character appearances out front of it. There’s also a Storytelling room with none other than Mrs. Claus herself! The kids can write a letter to Santa and drop it at the North Pole Post Office and even get a chance to meet with SANTA! So much fun! But the really treat here is when you go into ICE itself! You first come to a Parka station where you get one of their free Parkas to use while you walk through the exhibit. It’s a COOL 9 degrees inside so if you’re prone to chills..GET THE PARKA! I happen to enjoy the cold and this Floridian took the opportunity to wear a faux fur coat! WIN! But, if you want to enjoy the other ICE slides inside this area you’ll need to wear a Parka. It’s required. So get the Parka! I also suggest wearing gloves and keeping your cell phone warm. I had mine in a Lifeproof case and that saved it from shutting down like all the others around me. The cold drains the battery almost instantly! 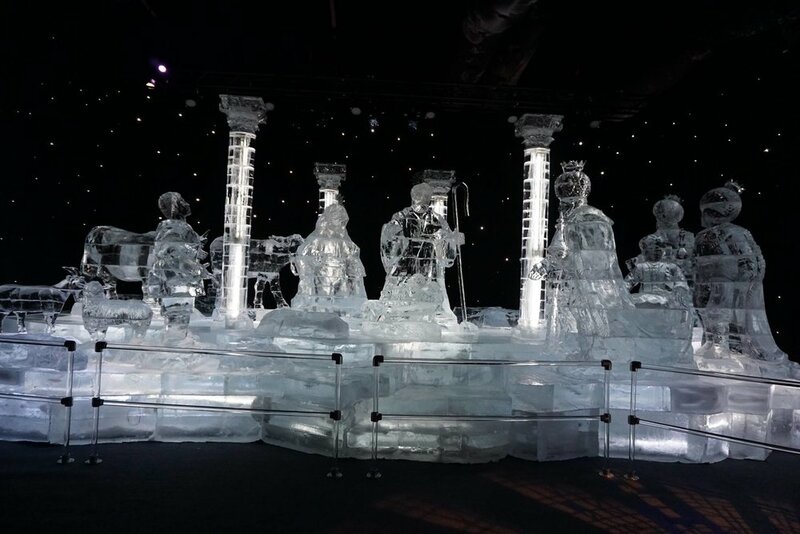 All in all you’re surrounded by beautifully carved ICE sculptures, but the most breathtaking part of the whole experience is the last scene… The Nativity Scene stops you in your tracks! Take the time to Enjoy! If you’re interested in booking a package at the Gaylord Palms for ICE or adding it to your Walt Disney World holiday vacation, I’d love to help! Unwrap The Holidays at Walt Disney World! Walt Disney World is a winter wonderland of twinkling lights & holiday magic! Curious how the Parks transform into their holiday splendor so quickly? With Disney's new Yuletide Fantasy & Holiday D-Lights tour, guests will be able to venture backstage to meet with the Holiday Services Cast Members! Discover how Cinderella's Castle is immersed into its spectacular display of thousands of twinkle lights and experience Epcot's popular Candlelight Processional. Disney’s Holiday D-Lights is offered on 12 select nights throughout the season. 'Tis the season to contact your Travel Agent to register for this special tour during the holiday season! From November 18th-January 6th 2018, both The Wizarding World of Harry Potter™ – Hogsmeade™ and The Wizarding World of Harry Potter™ – Diagon Alley™ will be transformed by festive decorations, treats and special entertainment. And when the stars begin to shine, a stunning projection wraps Hogwarts™ castle in dazzling holiday spirit. The Minions are back for a new incarnation of the Universal Holiday Parade featuring Macy's! Experience magic and mayhem as the minions help celebrate Holiday magic in this fun parade! Grinchmas™ will be back at Seuss Landing™. Experience this Who-liday Spectacular, a live retelling of Dr. Seuss’s classic holiday tale starring The Grinch™ Make this experience even more exciting by booking a breakfast with the Grinch and his friends! Nothing says Christmas like the classic sounds of Mannheim Steamroller! Performances available on select dates!! Universal Orlando Resort™ is the place to be for the Holidays!! It's not too late to book a trip and enjoy all the amazing events going on this Fall! Contact our Universal Studios Specialists here today for more information!